I first met 58-year-old Yolanda “Yollie” Santos in 2009 when I was the chairman of the Lectors and Commentators’ Ministry in our parish. Back then, she was the chairman of Mother Butler Guild (MBG) so we would always have encounters, conversations, and quick discussions. She’s the type of person you can easily get along with ‘coz she’s very accommodating, friendly, and exudes a very vibrant personality. So when I found out that she was a reflexologist, I didn’t hesitate to invite her to our house to give us a regular home service massage. Our regular sessions gave me the opportunity to get to know her more. I learned that she’s a native of Rodriguez (Montalban), Rizal and that she used to work as a caregiver in Taipei, Taiwan from 1996 to 2001, and that she was the breadwinner, providing solely for her kids after she separated from her husband. In 2004, she studied Reflexology at the Technical Education and Skills Development Authority (TESDA) Calamba Youth Training during her stay in Pansol, Laguna while overseeing her uncle’s property. There she worked as a reflexologist in various resorts near Mt. Makiling, servicing Korean, Japanese, and Filipino patrons who pay PhP 500 for a half an hour massage. In 2008, Yollie’s mother urged her to go back to her hometown in Montalban to personally take care of her three kids and when she got back, she started attending church and later on joined the MBG. Just by looking at her, you wouldn’t know she’s carrying a burden. She continued working hard, visiting our home, and giving regular home service massage, until one day, she just stopped going to our house and we found out she’s sick. Yollie had been diagnosed with bone metastases or bone cancer – her second encounter with cancer. She first had Invasive Ductal Carcinoma or Breast Cancer (Stage 1) that her right breast was removed. She was declared free of cancer after undergoing 12 chemotherapy sessions that costed her around PhP 30,000 per session, excluding the dextrose, laboratory fees, and medicines. When she first found out about it, she said “I couldn’t speak. I wondered where I would get all the money for my chemo. I started questioning God, ‘Why me? I’m a good person. I’m not a murderer!’ But I apologized afterwards and just my fate as a test on my faith,” said Yollie. 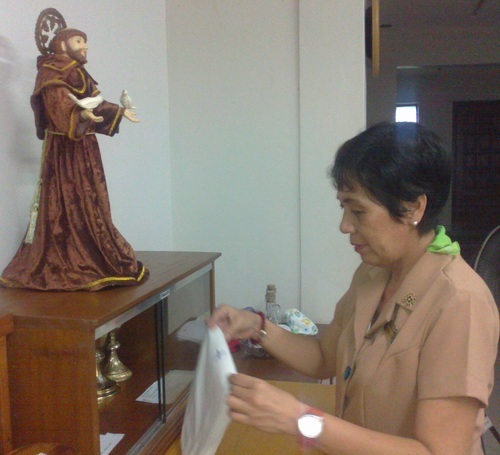 With God’s providence, she was able to undergo chemo sessions from funds coming from the Philippine Charity Sweepstakes Office (PCSO), some parishioners, friends, parish organizations, municipal mayor, and congressman. Yollie’s hair fell off during the chemo but she still continued serving the parish while sporting a bandana. But aside from that, nothing’s changed in her. She’s still the jolly and active person she used to be. She admitted she tried to be positive for her kids and grandkids. And it paid off because after several chemo sessions, she was declared free from breast cancer. “If you feel something different like a lump on your breast, seek help or have it checked immediately. Don’t be afraid. Have faith in God because He’s knows everything,” Yollie said. However, in November 2011, Yollie figured in a minor accident when she and her friends attended a pilgrimage in Tanay, Rizal. A seemingly minor injury had caused her pain in her right breast that she was advised to undergo a bone scan. But because of lack of money then, it was again put on hold. When she finally had a bone scan in June 2012, the doctor found a Bone Metastases or Bone Cancer – another cancer – that made her really devastated! She prayed hard there was just confusion or mixed up in the results, but there wasn’t and it was real! Looking back, she used to feel constant pain in her leg but she was just ignoring them, until everyone noticed her drastic weight loss and she also began noticing a different color in her urine so she was alarmed. Unlike before, Yollie’s hair didn’t fall anymore after undergoing chemo sessions, but she still felt weak, especially when she thought about where to get the money again for her dextrose, laboratory fee and maintenance, vial, and etc. for her next sessions. “I used to be stubborn. I don’t go to church before. But I’m glad I attended church before I had this sickness. I’m really scared – scared for my grandchildren and kids. I’m also sad because there are very few people who devote their time in serving the church. I feel I was brought here to serve and prepare for my condition. Please pray for my recovery. I still would like to serve our parish in the future,” said Yollie. After a while, we thought Yollie was doing okay as she was able to serve the parish again as a member of the Lectors and Commentators’ Ministry. Until recently she stopped serving again and we learned that she’s having a hard time walking after suffering a twisted vein in her spinal cord. Her doctor advised her to undergo a therapy and to have back braces and right now, she has no means to pay for that. She has no regular job, she can’t go back to working as a reflexologist and her kids have their own families too, so she has no one else to turn to. I am posting this for Yollie to try and give her another fighting chance. Please share this post with family and friends. We would be eternally grateful for any support you are able to give Yollie. Thank you in advance and may God bless you more.